The 1994 50th Anniversary of the D-Day Landings design is the second rarest 50 pence coin in circulation and has a value of 50 pence, but collectors of coins currently pay £3.28* to own this coin. Do you have one to sell? : Recent sales of this coin on eBay achieved £3.09 to £3.62 based on a sample of 400 sold items, taking the mid price* and a 10% range of ordered prices. 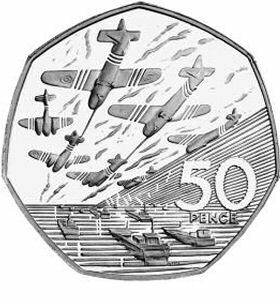 Details A design representing the Allied invasion force heading for Normandy andfilling the sea and sky, together with the value "50 PENCE"